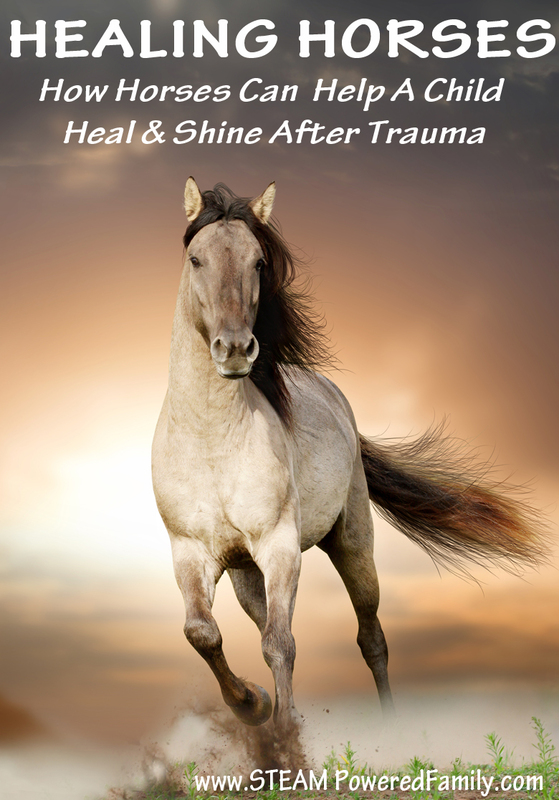 Horses and childhood trauma healing are a special combination that can bring miracles. We know because it happened with our son. Horses have a special magic, an energy that is uniquely theirs and which can have a profound effect on humans, especially children. They capture the imagination, hold your spirit, and heal your soul. But most importantly horses can help a child shine when the world has dimmed their sparkle. It started when I could barely talk or walk, I wanted a pony. Over the years I begged and pleaded for lessons but it wasn’t until I was 9 years old and an equestrian facility opened up within driving distance of our home that I finally saw my dream come true. And fulfilling every dream and fantasy my life from that moment forward revolved around the barn. I rode, trained, competed and bred horses. I lived and breathed horses. Horses helped guide me through my difficult teenage years. They kept me focused and healthy. Throughout my adult years I slowly drifted from my beloved horses. They are expensive and take a great deal of time. Time I no longer had once I was working full time. Then I started a family. Our youngest son is adopted, he struggles with a history of trauma and resulting PTSD and developmental trauma disorder. I talk about the effects of trauma on children and the developing brain in my post, The Trauma Tree. It’s incredibly hard to parent a child whose brain has been so devastatingly altered by trauma exposure. Traumas they can’t remember and often we don’t even know about as their adoptive parents. After struggling for many years to find the right help, I heard about a program that utilized animals as part of their therapy program. They were located on a ranch not far from our home, and after having yet another children’s mental health professional say they didn’t know what to do with my pre-verbal, severely traumatized boy, I called the ranch. When I discovered they had horses my heart told me this was what we needed for healing. My horses that had given me so many blessings in my life, I hoped could do the same for my boy. And they did. Immediately and drastically, bringing about peace and healing. Within 6 months my son was a different child. The trauma that dominated every moment of our lives didn’t go away. Childhood trauma never really does go away, but it receded, letting my little boy shine and grow stronger than the trauma that haunted him. Even after many years, the power of the horses to help my son continue healing is undeniable. We go back to the ranch, and the healing we know he needs, whenever he faces new struggles and the trauma starts to gain power and strength. Horses help my son stay stronger than the trauma. They give him power over the trauma. 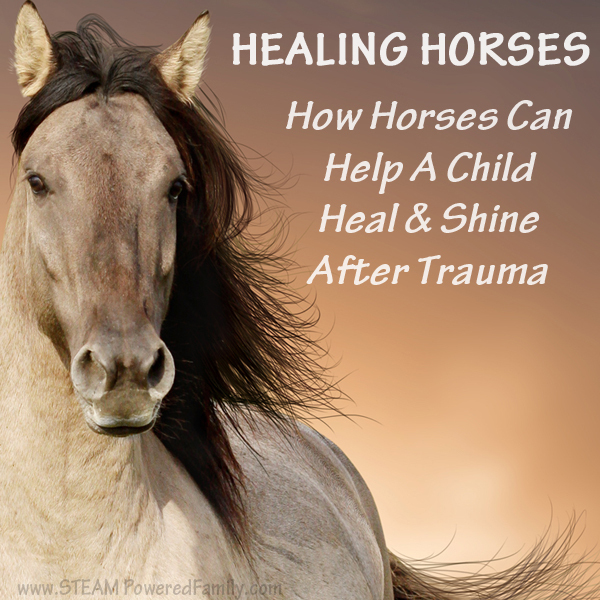 Horses can be fabulous healers for children with trauma history. They are very tuned in with human energy and emotions. They provide immediate rewards and responses to changes in energy. When my son was frantic, the effects of trauma washing through his brain and body, the horse would get stressed and bounce it’s head, pace away, pull his ears back and become agitated, stomping its hooves. But as soon as my son became focused and calm, present in the moment, no longer trapped by the trauma, the horse would let out a big, nickering sigh and stretch out its muzzle towards my son. Or perhaps tickle him with its muzzle, in a type of horsey love kiss. It’s whole body would take on my son’s new, relaxed, positive energy. Very quickly my son learned to use the horses to gain a better understanding of his own emotions and feelings. They were the perfect mirror for him to see himself. And through that he learned how to regulate himself. Yes, he started regulating himself! This is huge for children with trauma history. To feel safe and in control of their bodies to the point they can regulate themselves. All of this was achieved without a word of therapy. Which after years of trying, we knew wouldn’t have worked anyway. He was so trapped in his instinctual fight or flight brain, words had no meaning. But the horse was able to bring meaning to all of this feelings and emotions. They helped him understand his body and how to control it. Horses were the ultimate mirror, reflecting back my son’s inner most emotions and feelings. Without using any words, horses helped my son understand himself. They saw the trauma, but moved past it. Bringing out the sweet, loving boy we knew was struggling to escape from under all the trauma that was smothering him. Two years after horses first helped my son shine, he was struggling to learn how to read. Reading seemed to be an insurmountable obstacle. Until he joined an equine literacy program where he practiced reading to horses. Suddenly my son loved reading and he looked forward to every visit to the barn and his new reading buddies. Once again the horses came through, giving my son the confidence he needed, and the calmness he craved, so his brain could find a place of peace, healing and best of all, learning. The healing power of horses for children with a history of trauma is extremely powerful. They will forever hold a special place in the hearts of our family. They gave us our son. This is so true! My grandparents started a therapeutic riding program on their farm and when I was in high school I was able to start volunteering with the program (that had since moved to a new location after my grandparents retired). There were so many miracles that could not be explained, except that there really is a magic connection between horse and rider. I am a VERY FIRM believer of equine therapy. I was abused as a kid, and raising and training my horse literally saved my life! I had hoped to one day open up an equine therapy center for troubled teens, but it hasn’t happened yet. I was also abused as a child..i often felt suicidal but when my dad decided to get me a horse my whole world changed..i became brave and self confident..thanks to a farm called Sans Souci Arabians there i learned how to have structure to know love and not be afraid..I owe my life to the kind souls at that farm and the horse i will never forget .S.S.Ides of March..?? Thank you so much for having the heart to share your story. I hope it helps others find healing. Did you use hippotherapy with your son? Or therapeutic riding? Something else? This is the first time I’ve run across this for children with trauma history and I’m intrigued. We also have a daughter with (recently diagnosed) Prader Willi Syndrome and I’m seeing therapeutic riding as a recommended therapy for PWS too. How incredible if horses could help both of them! Can you tell me more about the process?